Dry hair is a difficult thing to manage, but luckily there are lots of dedicated haircare ranges out there to help it out. One of the newest ranges on the market comes from L'Oreal Professional and everything in it is silicones-free. I have to admit that I haven't gotten along with many of L'Oreal's shampoo and conditioners in the past as their formulas don't always agree with my sensitive scalp (too much artificial fragrance etc), so it's been some years since I've used anything from them. 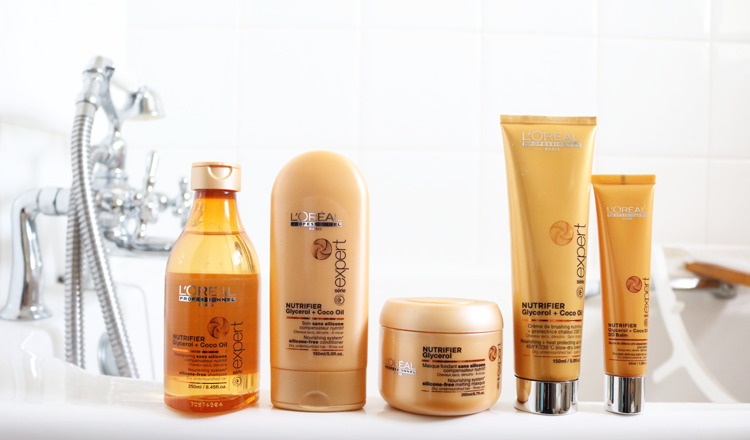 I tend to stick to a lot of natural and organic brands these days as regular readers will no doubt have seen, but when I spotted that L'Oreal were listening to consumers who wanted haircare made without silicones, I thought I'd give them a try. 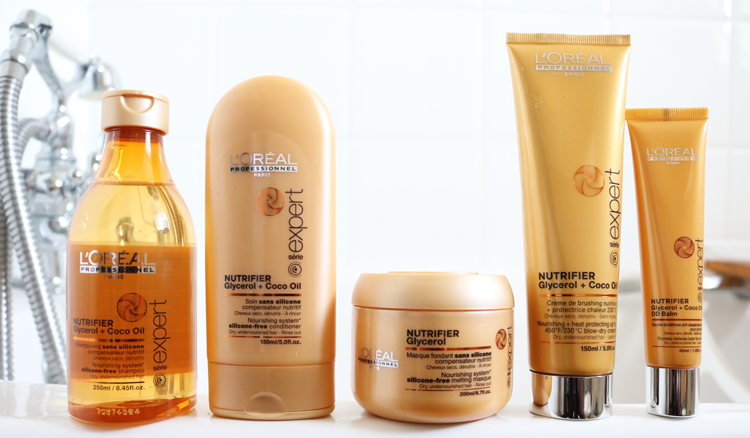 There are five products in the Série Expert Nutrifier range (and one new in-salon treatment), and I've been putting them through their paces for the last month or so. The Nutrifier range has been specially formulated for dry, undernourished and lacklustre hair, and features a new Glycerol and Coconut Oil formula to hydrate, nourish, add shine and prevent split ends. As mentioned above, the whole range is silicones free and some products are also free from sulphates. The first few times that I used the shampoo, I loved how my hair felt. It was silky soft, super swishy and most of the frizz had been eliminated so it was much easier to style afterwards. Sadly though, this feeling didn't last long and after two/three weeks, my hair started to feel really weighed down and was getting greasy quickly which is always an indicator to me that it's just too heavy and rich for my fine, dry hair. The shampoo also contains SLS which started to irritate my sensitive scalp so I had to stop using it. The matching conditioner though was thankfully a much better success story! It's got a great lightweight texture that isn't heavy on my fine hair, and it washes out easily, leaving my locks moisturised, shiny and feeling stronger. The only bugbear that I could find with it is that it's in a really small 150ml bottle which won't last long for those who have long hair like I do. This hair masque is very similar to something like my beloved Macadamia Deep Repair Masque in terms of performance and what it does for my hair. It's nicely thick but absorbs easily and doesn't feel like it's simply 'coating' my hair. I like to use this once a week or a fortnight, and it gets to work in just 3-5 minutes. After rinsing and drying, my hair is left manageably soft with noticeable shine, so this is something that I'll happily continue using in the future. If you blow dry or like to use any kind of heat appliance on your hair, a heat protector product is absolutely essential to prevent damage later down the road. I tend to use a mix of sprays and creams, so it was interesting to try this one out, and I have to say it's been working well for me so far. This one's formulated to protect hair up to 230C, doesn't feel sticky, and doesn't leave any residue build up. The 'DD' in this product stands for 'Dryness-Defense' which essentially makes this balm a leave-in conditioning treatment to further help to protect and nourish dry hair. As with most products of this nature, you only need to use a tiny amount per application and I'd recommend using half the amount that you think you'd need if you have fine hair. It took me a couple of trials and errors to figure out the right amount for my hair, but once you come across it, it's brilliant. Does exactly what it says on the tube; it leaves my hair and ends soft, shiny and feeling nourished. Also works really well as a final styling product to smooth out any frizz and flyaways for a sleek finish.